Mouse anti Human involucrin antibody, clone SY5 used for the identification of involucrin expressing cells in dysplasic tissue by immunohistochemistry on formalin fixed, paraffin embedded tissue sections. Cell proliferation and differentiation staining pattern in in-vitro grown tissues. 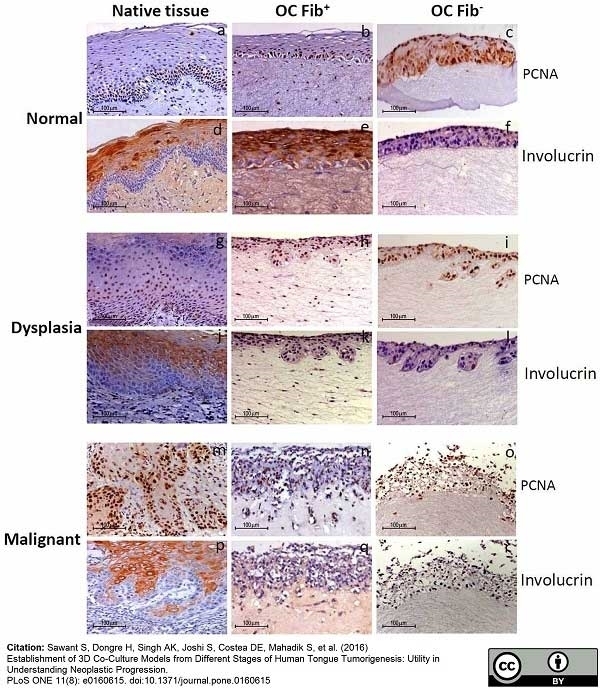 Immunohistochemical staining for cell proliferation and differentiation specific proteins in Fib+ and Fib- OCs reconstructed from normal, dysplastic and malignant tongue tissues along with their respective native tissues: PCNA nuclear staining was seen in the basal proliferating cells of normal- native tissue, Fib+ and Fib- OCs (a, b, c) while cytoplasmic involucrin staining was seen in the upper differentiated cells of normal- native tissue, Fib+ and Fib- OCs (d, e, f). PCNA nuclear staining was seen in the basal as well as supra basal cells of dysplastic-native tissue, Fib+ and Fib- OCs (g, h, i) while cytoplasmic involucrin staining was seen in the native dysplastic tissue but not in Fib+ and Fib- OCs (j, k, l). PCNA staining was observed throughout the epithelium of malignant-native tissue, Fib+ and Fib- OCs (m, n, o), while involucrin staining was seen in the differentiated cells of malignant-native tissue but not in the Fib+ and Fib- OCs (p, q, r). The experiments were performed at least three times. Establishment of 3D Co-Culture Models from Different Stages of Human Tongue Tumorigenesis: Utility in Understanding Neoplastic Progression. Mouse anti human involucrin antibody, clone SY5 recognizes human involucrin, a 585 amino acid soluble protein encoded by the IVL gene expressed in epidermal keratinocytes as they tend towards terminal differentiation. Involucrin is produced in the stratum spinosum initially in the cell cytosol from where it moves to the cell membrane, associates with transglutaminase and becomes cross-linked to membrane proteins, offering structural support to the cell and forming a stable envelope below the plasma membrane. Mouse anti human involucrin antibody, clone SY5 recognizes an epitope between residues 421-568 of human involucrin. Involucrin expression is seen in the normal granular cells of the epidermis associated with the plasma membrane during the early phase of cornified envelope maturation (Ishida-Yamamoto et al. 1996) and expression is increased in psoriatic epidermis with abnormal cornified envelope maturation (Ishida-Yamamoto and Iizuka 1995). Involucrin staining is also maintained, associated with the cornified epidermis in epidermolytic hyperkeratosis, a condition associated with mutations to mutations in genes codong for cytokeratins 1 and 10 (Ishida-Yamamoto et al. 1995). Purified involucrin from human keratinocytes. Spleen cells from immunized Balb/c mise were fused with cells from the P3X63Ag8 murine myeloma cell line. MCF-7 cells. Localized to upper spinous and granular layers in normal skin. Hudson, D.L. et al. (1992) Characterization of eight monoclonal antibodies to involucrin. Ishida-Yamamoto, A. et al. (1997) Involucrin and SPRR Are Synthesized Sequentially in Differentiating Cultured Epidermal Cells. J Invest Dermatol. 108: 12-6. Caldelari, R. et al. (2000) Long-term culture of murine epidermal keratinocytes. J Invest Dermatol. 114: 1064-5. Ishida-Yamamoto, A. et al. (1996) Immunoelectron microscopic analysis of cornified cell envelope formation in normal and psoriatic epidermis. J Histochem Cytochem. 44: 167-75. Janes,S.M. and Watt, F.M. (2004) Switch from alphavbeta5 to alphavbeta6 integrin expression protects squamous cell carcinomas from anoikis. J Cell Biol. 166: 419-31. Michael, M. et al. (2014) BPAG1-e restricts keratinocyte migration through control of adhesion stability. J Invest Dermatol. 134: 773-82. J Biosci Bioeng. pii: S1389-1723(14)00071-1. Sawant S et al. (2016) Establishment of 3D Co-Culture Models from Different Stages of Human Tongue Tumorigenesis: Utility in Understanding Neoplastic Progression. PLoS One. 11 (8): e0160615. Srivastava, S.S. et al. (2018) Keratin 5/14‑mediated cell differentiation and transformation are regulated by TAp63 and Notch‑1 in oral squamous cell carcinoma‑derived cells. Oncol Rep. Mar 06 [Epub ahead of print].